Excellent, amazing, wow, stunning are all words that come to mind when describing Connie and her work. Working with her on the shoot was amazing. She knows exactly what we were looking for and was patient and kind with my fiancé who had a hard time relaxing. By the end of the shoot he was really enjoying himself and the moment. Now for the wow and stunning part... our photos were beyond what we expected. Connie captured everything I wanted and our story was told with every single photo. I cried when I first saw them and I know our friends and family felt the same. Everyone was raving about how breath taking they all were. Connie is truly talented, warm hearted, and embodies the full definition of a professional photographer. We are so lucky that we chose her to be a part of our love story. We always love your work and are so appreciative of your time and patience. We had a great time, and enjoyed spending time with you, too! Thanks again! Wow! After working with Connie Feng over the past year and a half, my husband and I are singing her praises. I couldn't have asked for a better photographer for our engagement, bridal, and wedding photos. Not only is her work top-notch, but working with her has been so much fun. I was floored by the quality of our photos – she captured moments from our wedding that really tell the story of the day. Thank you Connie for helping make our wedding so wonderful! Connie, I had to take a second to thank you again from the bottom of my heart for the incredible photographs of our day. We are so in love with every one of them. You captured it so well that our extended family and friends felt like they were there just by looking at them. The photos of my father and I bring everyone to tears, and are so special to me. I made an album for our families to enjoy and can't wait to see them relive that day again. Thank you!!! We used Connie for our engagement session and then for our wedding as well. Connie was not only flexible and accommodating, but our pictures turned out beautiful! Since we were on an extremely tight budget I told Connie what pictures I really wanted and what price I could do and she tailored a package to fit my needs. Our pictures are artistic, candid, and so incredibly romantic. I highly recommend using Connie Feng Photography! 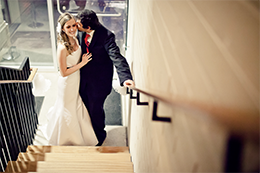 Hi Connie, The photos are amazing, they completely exceeded our expectations! Thanks so much, we are so happy with them. We had a lot of fun working with you! Thanks for your kind note and all of your hard work. We are so impressed with the quality and style of the photos, and so are our friends and family. Connie was the ONLY photographer in the Hampton Roads area that was willing to put together a contract tailored to what I wanted, not an overpriced package of a bunch of stuff I did not want. Since we had a eloped six months ago and were having a reception-only, we didn't need a photographer all day, so Connie was able to block the time accordingly for bride/groom shots, family, and reception. Even though we were stressed out about the day, Connie was able to get some great photos and put us at ease. Connie gave us a collection of great memories that we will have forever! My husband and I were just married in May 2010 and we were Connie's first beach wedding. We had very small and intimate ceremony (8 people) and she was one of the only photographers who didn't try to put us off in case a bigger gig came along. Her prices were also very reasonable and her turn-around time for the photos – delivered on a hi-res DVD – was great (we had them about a week after we returned from our honeymoon.) She also did a really great job as we wanted more candid shots and not so many portrait-type formal shots. Connie was always very quick to respond to us when we contacted her – something we appreciate greatly. She was open to our ideas in terms of what we wanted and her close-ups of our rings are amazing. We thank her for her time, effort, and great photos! We booked Connie as our engagement photographer as well as our wedding photographer. She is a up and coming photographer in the North Carolina area and she is a lot of fun to work with. Overall, we were very happy with our photos, both our engagement session and our wedding. After seeing our engagement photos we decided she would do great on our wedding. Her photos are amazing and for a great price. I would book her again in a heartbeat! Hi Connie, I think I told you that I hate having pictures taken of me, and I have been accused of not being able to evaluate pictures taken of me objectively. So I wanted to be sure to tell you that I finally worked up the fortitude to look at the wedding pictures, and I absolutely love them. They are exactly what I wanted for the style, and you did an amazing job capturing the spirit of the day. Thank you so much for all your hard work. Ahhhhh!!!! Connie, these are AMAZING!!!! I'm just tickled to death with how wonderful they all came out! And your editing was phenomenal. These are all perfect and because of that, it's gonna take us a little while to decide our favorite favorites for ordering. Talk to you soon and thanks again for being so wonderful! Dear Connie, Thank you so much for spending the day with us on Vivianne's 100th day! We really love the photos that you took to help us remember the day. Everything was incredibly easy, from the day itself to the CD with all the images. Thanks again!